There is so much to see and do on your Ambergris Caye vacation that it is difficult to know where to start, but here are some memorable things to do in the water, on top of the water, and on land. On your Ambergris Caye vacation, a shallow dive is a must or at least an easy warm-water snorkel over the beautiful living coral at Hol Chan Marine Reserve. You will see teeming marine life such as turtles and lobsters. 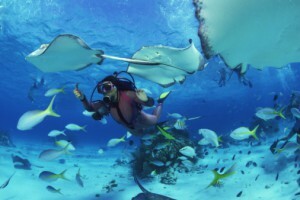 Near Hol Chan is one of the best dives in the Caribbean, Shark Ray Alley. Four-foot-wide rays and nurse sharks loiter here. It is safer not to pet the rays, but instead, take some amazing photos such as take some amazing photos with a disposable underwater camera. If you want to be on the surface, rather than beneath the water and still want to enjoy a marine adventure, the family oriented American Crocodile Education Sanctuary is the place to go. A tag-and-release program gives scientists useful data and provides opportunities for vacationers to see and touch saltwater crocs. A special treat is the aptly named, “Eye-Shine,” an evening tour through mangroves. If you want to stay on solid ground on your Ambergris Caye vacation, you can explore some of these interesting spots. Want to get to know the native culture? The Black & White Cultural Center had a colorful past as a brothel but now vibrates with beating drums, singing, and dancing where guests can join the fun. Feel like a walk on the wild side? The un-restored Marco Gonzales Maya Site is great for history buffs. A self-guided tour is a quarter-mile jungle boardwalk, so mosquito-proof yourself. Or, take a Belize Jungle Trek and ride. Do you want to exercise? You'll flip for the Toucan Jumper Bungee Trampoline combination at the Sandbar restaurant, or you can marvel as others tumble mid-air. If that is too tame, try the zip-lines. Artistic? Check out the Gallery of San Pedro, which features local artists. These are places to start, but there is no end to the fun activities on Ambergris Caye, so you might as well start planning your next trip now. Check out the Exotic Caye Beach Resort for a relaxing place to stay on the beach in central San Pedro.